So, it’s no surprise to anyone who knows me that I’m an Oregon fan. And it also wouldn’t be a surprise to anyone to hear that Chip Kelly takes a job with Cleveland/Philadelphia/Buffalo/KC/Arizona/etc. As a fan, I don’t think about Chip leaving and I would like to think that he’s an Oregon faithful much in the way Mike Belotti and Rich Brooks were. However, I am smart enough to know how the coaching carousel works these days. Plus, from some insiders in the Oregon athletic department, I know a little more about Kelly’s personality than he will talk about with the media. One glaring red flag is that Kelly apparently hates the process of recruiting. He hates going to LA to convince little Johnny that Oregon is the place he wants to play, not USC or Stanford. He would much rather reload on one day in the spring and know what his roster will look like right away. Say it ain’t so, Chip! So, considering that he hates recruiting, and considering that he has more buzz now than ever, and considering that almost a quarter of the league’s head coaching jobs are vacant, it might be safe to say that Chip is on his way out. There have been some rumblings on who the next coach would be. Considering Oregon’s head coaching history, Mark Helfrich is sitting in the golden seat that is the offensive coordinator position. The last three head coaching hires at Oregon have been internally. Mike Belotti was Rich Brooks’ offensive coordinator and eventual successor. 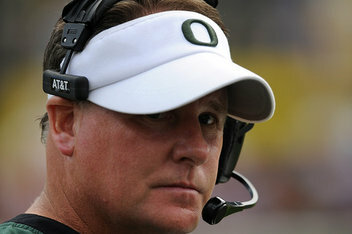 Chip Kelly was Mike Belotti’s offensive coordinator at the time of his retirement and is now the Oregon head coach. As Chip Kelly is becoming more flirtatious with his NFL suitors, Helfrich looks to be next in line. Now, there have been rumblings about Chris Peterson being a candidate for the job. I extremely dislike that move. First, one of the appeals of Oregon as an attractive destination is that the coaching staff has been relatively untouched for the last five years (defensive coordinator Nick Aliotti has been there for thirteen years straight and 20 years total (he had a stint in the NFL for St. Louis and spent one year at UCLA before coming back to UO in 1999). If Peterson came in, he’d want to bring in his own staff. That could lead to a perceived instability in the organization. Also, if Peterson came in, he’d likely want to install his own offense. While guys like Mariota and Thomas could thrive in a pro/multiple offense, I don’t think the linemen and wide receivers are built or conditioned for such an offense. And, on top of that, Oregon’s breakneck speed and ultra-fast offense are part of the appeal to going to school there. I doubt they splurge for him and spend quite a bit of money luring him from Boise. Helfrich knows the system, he also has been a part of the culture that has been built at Oregon. An anonymous source at Oregon was quoted in a USA Today article saying “I’m pretty sure [Helfrich] was the head coach this season for about 20 minutes,”  in reference to an effort by the Oregon AD on transitioning Helfrich to head coach. Lord knows I’d love to see Kelly stay in Oregon for the duration of his career, set all sorts of records, win multiple rings, and all of that. But modern sports won’t allow for that, and it’s a shame. Thanks for the memories Chip, you certainly won’t be forgotten in Oregon lore. Here’s to hoping you have a Mike Riley moment and find your way back to Eugene.